Because of a reader’s response on a previous post, I remembered an article I read about the death of Iva (Bausman) Leverton. It was found in the genealogy files belonging to Gertrude (Bausman) Schoenhard, a cousin of Iva’s and my maternal grandfather’s aunt. The accident sounds pretty horrific. There is no citation to the article. Two Warren women were killed Sunday afternoon when the car in which they were riding was struck broadside and then overturned on Highway 20 at an intersection 10 miles west of Freeport. Three of four other occupants of the two cars involved were still in critical condition this morning at Deaconess Hospital and the fourth was reported in fair condition. Dead from skull injuries are Mrs. LeRoy (Laura) Huett, and Mrs. Clinton (Iva) Leverton, both occupants of the front seat of the car driven by Mrs. Huett. State troopers said the Huett vehicle, southbound, drove onto the highway directly in front of the westbound car driven by Paul E. Nelson, Skokie. Stop signs control north-south traffic. 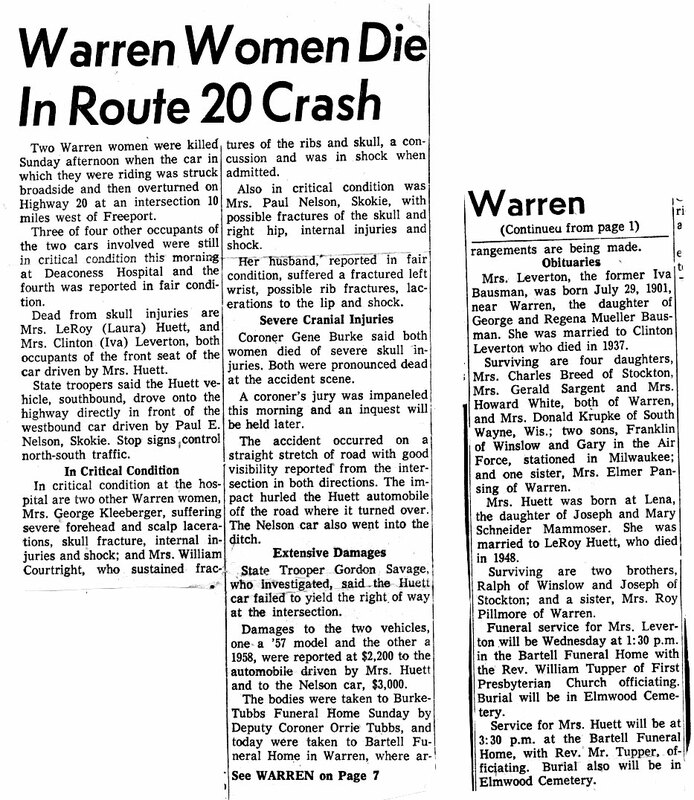 In critical condition at the hospital are two other Warren women, Mrs. George Kleeberger, suffering severe forehead and scalp lacerations, skull fracture, internal injuries and shock; and Mrs. William Courtright, who sustained fractures of the ribs and skull, a concussion and was in shock when admitted. Also in critical condition was Mrs. Paul Nelson, Skokie, with possible fractures of the skull and right hip, internal injuries and shock. Her husband, reported in fair condition, suffered a fractured left wrist, possible rib fractures, lacerations to the lip and shock. Coroner Gene Burke said both women died of severe skull injuries. Both were pronounced dead at the accident scene. A coroner’s jury was impaneled this morning and an inquest will be held later. The accident occurred on a straight stretch of road with good visibility reported from the intersection in both directions. The impact hurled the Huett automobile off the road where it turned over. The Nelson car also went into the ditch. State Trooper Gordon Savage, who investigated, said the Huett car failed to yield the right of way at the intersection. Damages to the two vehicles, one a ’57 model and the other a 1958, were reported at $2,200 to the automobile driven by Mrs. Huett and to the Nelson car, $3,000. The bodies were taken to Burke-Tubbs Funeral Home Sunday by Deputy Coroner Orrie Tubbs, and today were taken to Bartell Funeral Home in Warren, where arrangements are being made. Mrs. Leverton, the former Iva Bausman, was born July 29, 1901, near Warren, the daughter of George and Regena Mueller Bausman. She was married to Clinton Leverton who died in 1937. Surviving are four daughters, Mrs. Charles Breed of Stockton, Mrs. Gerald Sargent and Mrs. Howard White, both of Warren, and Mrs. Donald Krupke of South Wayne, Wis.; two sons, Franklin of Winslow and Gary in the Air Force, stationed in Milwaukee; and one sister, Mrs. Elmer Pansing of Warren. Surviving are two brothers, Ralph of Winslow and Joseph of Stockton; and a sister, Mrs. Roy Pillmore of Warren. Funeral service for Mrs. Leverton will be Wednesday at 1:30 p.m. in the Bartell Funeral Home with the Rev. William Tupper of First Presbyterian Church officiating. Burial will be in Elmwood Cemetery. Services for Mrs. Huett will be at 3:30 p.m. at the Bartell Funeral Home, with Rev. Mr. Tupper, officiating. Burial also will be in Elmwood Cemetery.